RICHMOND, Va. (3-29-16) – During her senior year in high school, Ezoza Nomazov remembers opening her materials to start class in AP U.S. Government for the first time. While this is usually a recap of American history for many high school students, Ezoza’s experience was different. This was the first time she would formally learn about the American governmental system. Now as a newly naturalized citizen, Ezoza, along with her brother Timur are following the 2016 presidential election in preparation to vote for the first time ever. Five years before their naturalization, the siblings’ journey to America helped define their views and found that it influenced their potential vote as Muslims. In 2010, Ezoza, 21, and Timur, 23, left Moscow, Russia, with their parents to move to Richmond. After their parents received green cards, they decided to join extended family members who were already in America to give their children a better opportunity. Their mother, Mohira Nomazov, said getting a green card was a long process. You have to enter your information into the immigration system and wait a couple months or up to a year for the results to see if your family is chosen. Ezoza and Timur are originally from Uzbekistan, an Islamic country on paper, according to Timur. Until 1991, there was no religion in the country and everyone was Atheist. He says that Uzbekistan’s practice of Islam is influenced by neighboring country Afghanistan, but it is not tolerated in reality. People are forced to practice Islam in secrecy. Ezoza said America is different than Uzbekistan, because America is more accepting. Their mother added that moving to America, despite its challenges, was easier than continuing to live in Uzbekistan. When they moved to Richmond, Ezoza entered her sophomore year of high school at the Collegiate School, while Timur started his first year of college at Virginia Commonwealth University. While attending the university, Timur joined the Muslim Student Association. 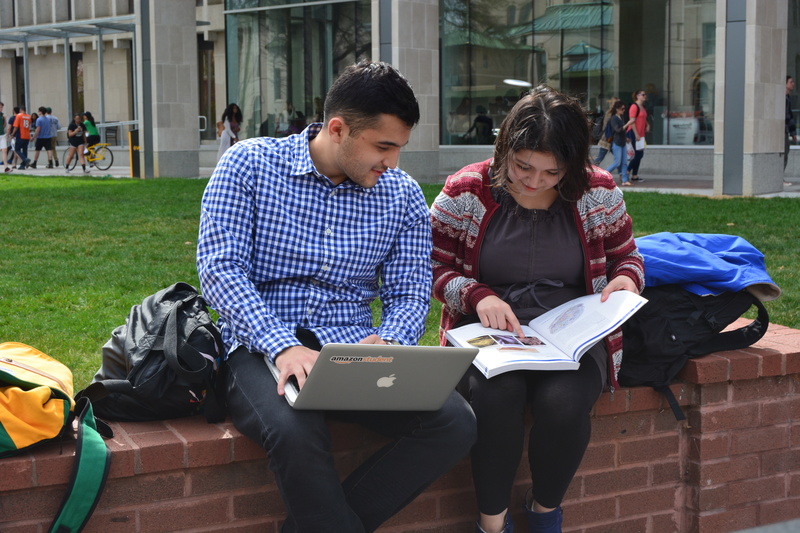 Imad Damaj, the faculty advisor of VCU’s Muslim Student Association, said the organization is meant to support and promote understanding between Muslims, while connecting them to communities outside of VCU. Timur said that while he did not intend to find the organization, it made a difference in his transition to America. Mohira said she was proud to see her children receive the level of support and education they did while attending these schools. During Ezoza’s senior year of high school, she found her AP U.S. government class to be beneficial. She said it helped to pay attention, because it introduced her to the American system. Suzanne Lewis, Upper School History Teacher and Chair at Collegiate School, said the AP curriculum for American politics includes the rise of political parties and how they work, and the voting process and interest groups. More specifically, the curriculum can focus on current events such as the 2016 presidential election. She said the school also uses history and government classes to prepare students for voting. Timur said he never received formal education on American government, so he learned the American system on his own. The voting system is different in Uzbekistan, so the election process was a new concept for both him and his sister. He said watching the debate between President Barack Obama and Governor Mitt Romney in 2012 helped him learn about the two-party system and led to more research on the election process. Lewis said the Electoral College is not something other countries have adopted, and as a result can be a hard system to learn. After five years of living in America as immigrants, Ezoza, Timur, and their parents became naturalized citizens in November 2015. Lewis said young voters like Ezoza and her brother have to believe their vote will have an impact in the election. “The more people get involved in the process, the more they can say, ‘first [my vote] counts,’ and they actually care about policy and the direction the country’s going and you get a long-term voter,” she said. Timur said that while having the rights of American citizens is an empowering feeling, he believes the election’s radical candidates have changed the perspective of being Muslim in America. Damaj said the problem starts when people fail to take the time to fully understand the Muslim community. Muslims often think of how Americans view them, and that perspective has probably increased as a result of what has been said in the election and on the news. “We have to explain who we are, and we don’t want anyone to own our narrative; it’s our narrative,” he said. Ezoza and Timur said they think Republican presidential candidate Donald Trump uses his candidacy and the media the wrong way, and only influences the negative view of Muslims in America. Both Ezoza and Timur said they are supporters of Senator Bernie Sanders, R-Vt., because they follow his policies. They also convinced their mother to support him. As immigrants themselves, the Nomazov family’s decision will come from a different perspective, however they still believe it will count just as much as the next vote. “Because we are living in America, America is now my home, my country, so I have to be involved with voting,” Mohira said. Should Muslims Vote for Bernie?